VorMax flushing technology is the solution to maintaining a cleaner toilet bowl by simply flushing the toilet. 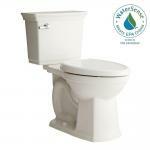 Its revolutionary VorMax flushing system completely cleans the entire bowl, including under the rim. The VorMax flushing technology has been independently tested and proven to CLEAN 2X BETTER than conventional toilets. This helps maintain a tidier toilet bowl longer, so cleaning is a breeze. Source: Test witnessed by IAPMO R&T Labs comparing VorMax against conventional under-the-rim-water-dispersal toilets from major retailers.